Now may be a weird time to write a glowing report about Cole Hamels. He’s fresh off a bad couple starts, and by ERA and WHIP, the Phillie lefty is having his worst season since 2009. On the other hand, his arsenal has never been more complete. Seen through at least this one lens, at least, Hamels is an ace in his prime. There might not be a better time to write that sort of post, at least. When Hamels came into the league, he had a great changeup and command of a decent fastball for a lefty, but he struggled with a breaking ball. That led to a weird sort of reverse platoon split — he gave up home runs to lefties. The change was a lesser weapon against same-handed hitters, and the curve was inconsistent. He was good, but he wasn’t Peak Hamels, not yet, not with all those homers. The first solution? A cutter. In 2010, Hamels started throwing an 89 mph pitch that bored in on the hands of lefties slightly, and the results were almost immediate. 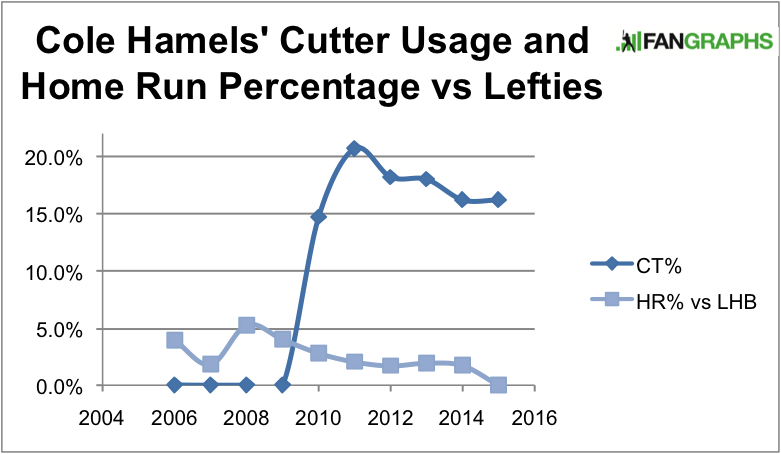 Before the cutter, Hamels gave up homers on 4% of his plate appearances against lefties. After he started throwing it, he’s done so 2% of the time. So then Hamels went nuts on the league, at least for two years. He was top five in strikeouts minus walks, top ten in WAR, top ten in ERA — he was an ace by any definition in 2011 and 2012. Nor was 2013 a bad year, either. By WAR — and really by most measures other than ERA — he was just about the same pitcher. But maybe that 3.60 ERA didn’t sit so well with Hamels, because he went to work that year, this time on a new pitch. Well, an old pitch that has become new. That curve, which he used a career-low 7% of the time in 2013? That curve, which gave him platoon issues early in his career? That curve, which hovered between mediocre and below-average early in his career? It’s not the same any more. It’s great now. Let’s look at it in pictures first. On the left, an early 2013 curveball at 75 mph. On the right, one from this season — 80 mph. The comparison is a bit unfair, given the locations of the pitches, but the one on the left is slower, with less bite, than the one on the right. 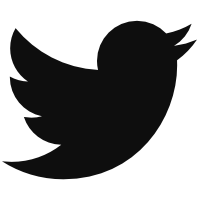 The movement and velocity have both changed. 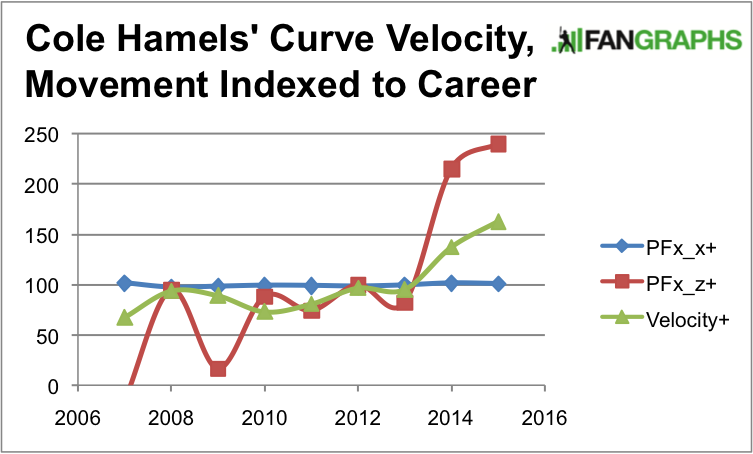 Let’s index his curve velocity and horizontal and vertical movement to career averages so that we can put them on the same graph. Hamels is now throwing the hardest, droppiest curve he’s ever thrown. And we know that harder curves with more drop get more whiffs. So it’s no surprise that his whiff rate on the pitch right now (19.7%) is almost double his career rate (10.7%). What may be surprising is how this arsenal now fits in with the other great pitchers of the game right now. For example, Hamels now has the best whiff rate on a curveball thrown at least 200 times this year… save for Clayton Kershaw’s 19.71%. And right now, even if you relax that threshold down to 100 times, here are the other starting pitchers that have two non-fastballs that are both in the top ten by whiff rate: Cole Hamels, Clayton Kershaw, Carlos Carrasco, Francisco Liriano, and Erasmo Ramirez. That last name might give you pause, but it shouldn’t, really. Not only has Erasmo Ramirez taken a leap forward this year — mostly by abandoning his bad curveball — but Hamels has better fastballs than the Ray. Give him a little extra credit for being a lefty (only five lefty starters have averaged better than Hamels’ 92.2 mph on the fastball this year, and the average lefty throws about a mph slower than the average righty), and you could call it plus. Cole Hamels: now with four plus pitches. Sounds like an ace, and probably even a bargain with those three years and $70 million left on his deal. We hoped you liked reading Cole Hamels, Now Even More Complete by Eno Sarris! Off Topic, I know, but where can I find ranking of Total Bases/IP? Greinke has 124 TB in his 131 IP and for the life of me I can’t find a site that lets me sort by TB/IP for this year or historically to see if this is something to follow as Zack goes forward. Baseball reference can facilitate this. Go to the play index, and search for single seasons, sorting by TB, and make sure IP is included in the output. Export by CSV to excel, and create a simple division function. Then sort the data. Here’s the rub: You’ll need a subscription to baseball reference to do this. Which I don’t have. Which is why I can’t just give you the answer. Baseball Reference has so much potential, but I do not want to waste money on a subscription for information that I can get for free on Fangraphs 99% if the time. There’s actually a play index function where you can search based on TB/IP. The trick is to play with the ratio until you get like 20 results, then you can sort ascending and descending to see all 20. The best season ever is Gibson’s 1968 obviously, with 254 TB in 304.2 IP. Next is Ryan’s 239/284 in 1972.